England won Basil D ‘Oliveira series 3-1. It was not a easy victory, they had to work hard to win the series, particularly after losing the 2nd test match which leveled the series 1-1. This was one of the rare series where teams batting first won all the games with a huge margin…and unlike other test series this was one was dominated by ball!. Both teams had problem in positioning their batting order – England have problem at the top – they debuted two batsmen at the top -viz Tom Westley and Dawid Malan, and along with them they had new rookie Keaton Jennings opening with experienced Alastair Cook. They are still trying to get the right opening combination. 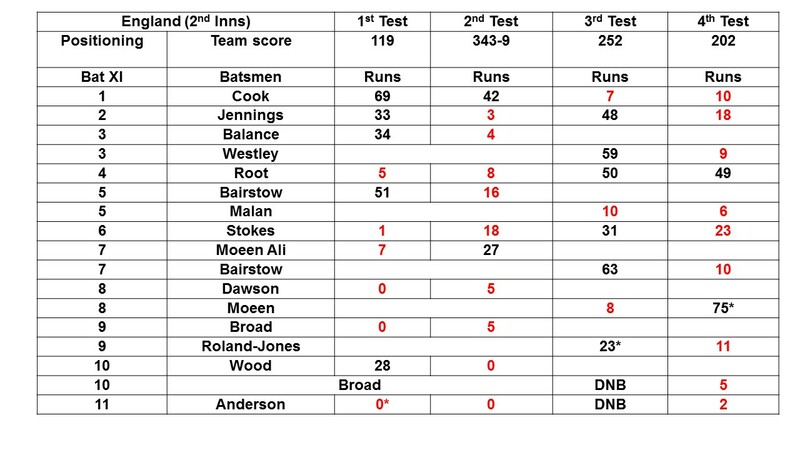 Their batting is heavily depended on captain Joe Root, Cook and Stokes, who are well supported by Bairstow and Moeen Ali. 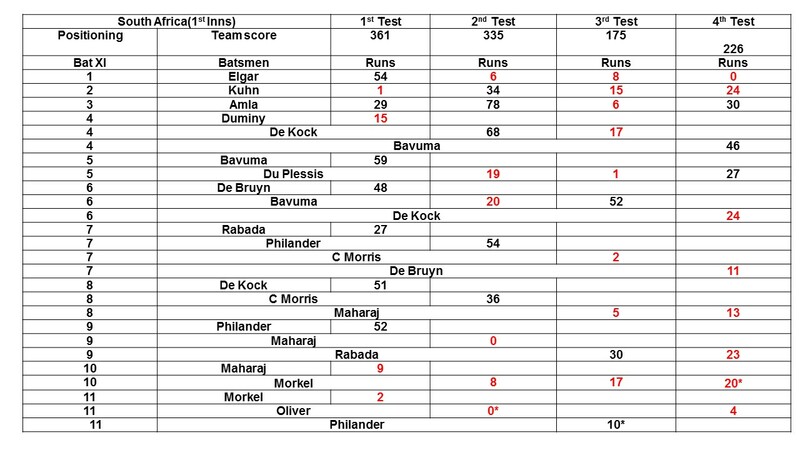 South Africa had middle order problems – like England rely on their captain Fa Du Plessis and Hashim Amla for batting. 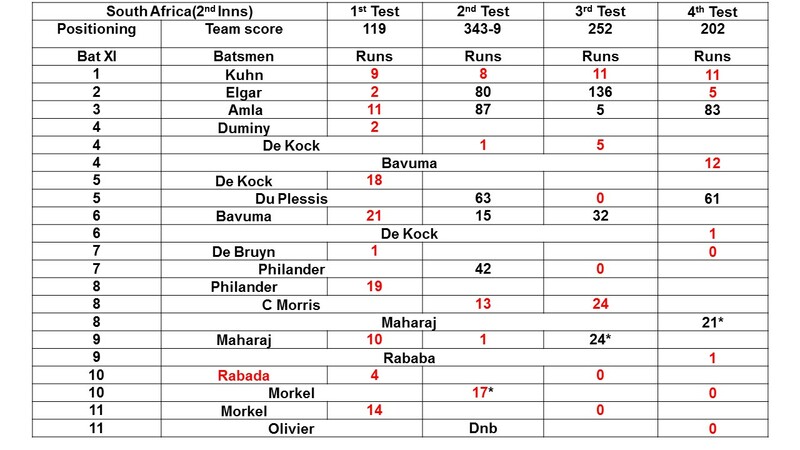 However Du Plessis was not available for 1st test – hence they had to shift their batting order in the first test. They were trying to balance the middle order. Three different players batted at No. 4 , No.5 and No.6. It was a rare occasion for South Africa to do something bold -viz they promoted De Kock at No. 4, but soon lost patience with him, and reverted him to lower batting position. One feels they should have kept him at the top for the whole series as they had Elgar and Amla to steady the innings. 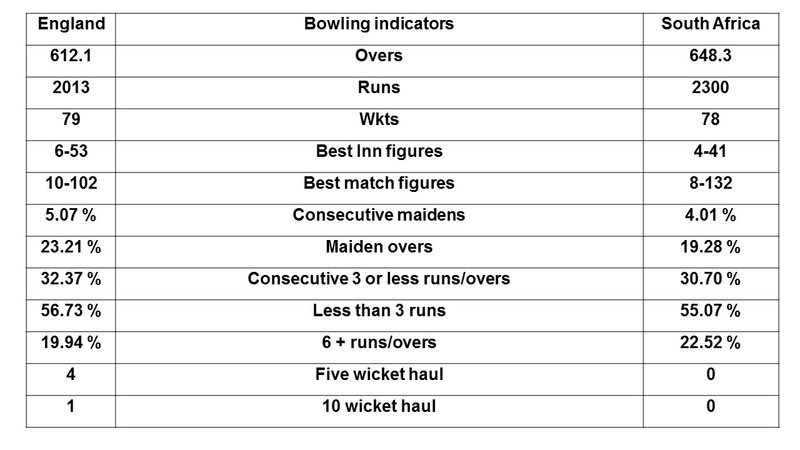 Usually the batting order is shifted in the second innings of a test match when teams are either setting a target, chasing or trying to save the game. It is a rarity to shift batting position in first innings of every test match. I believe this was major reason for South Africa to lose the series. 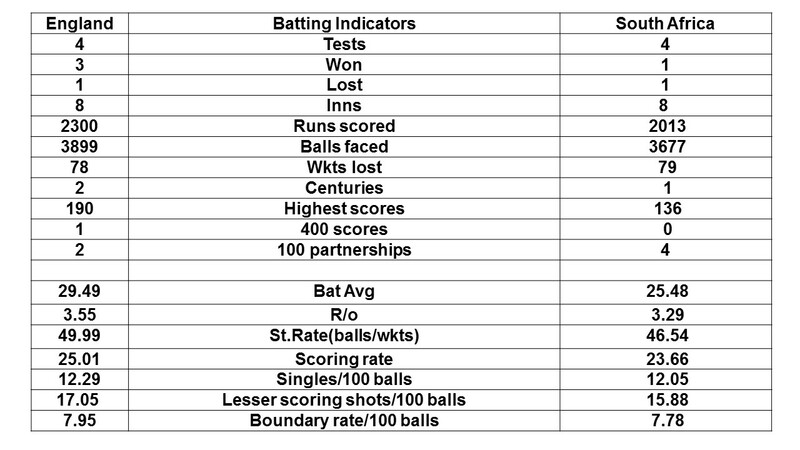 Below table features batting order of first innings of 4 tests for both teams. The low scores are marked in red. There is a constant change in personal for same batting position. three different batsman(Duminy, Bavuma, and De Kock) batted at No.4. -Only once 400 plus runs was scored. both teams used 14 players for the series. 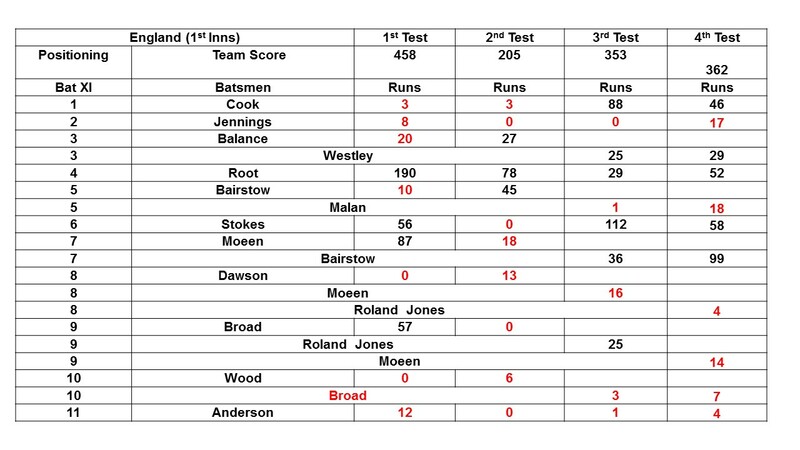 England had 3 Test debutants and South Africa one. It was a rare occasion for South Africa as none of their bowlers picked a five wicket haul in the series. For England Moeen Ali had the best test match figure.